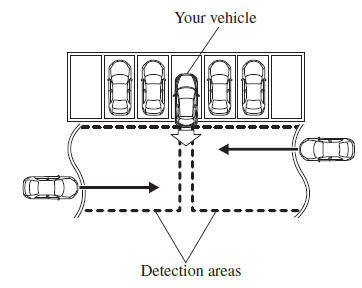 The Rear Cross Traffi c Alert (RCTA) system is designed to assist the driver in checking the area to the rear of the vehicle on both sides while the vehicle is reversing by alerting the driver to the presence of vehicles approaching the rear of the vehicle. The Rear Cross Traffi c Alert (RCTA) system operates when the shift lever (manual transaxle) or the selector lever (automatic transaxle) is shifted to the reverse (R) position. If there is the possibility of a collision with an approaching vehicle, the Blind Spot Monitoring (BSM) warning light fl ashes and the warning beep is activated simultaneously. Always check the surrounding area visually before actually putting the vehicle in reverse: The system is only designed to assist you in checking for vehicles at the rear when putting the vehicle in reverse. Due to certain limitations with the operation of this system, the Blind Spot Monitoring (BSM) warning light may not fl ash or it might be delayed even though a vehicle is behind your vehicle. Always make it your responsibility as a driver to check the rear. In the following cases, the Blind Spot Monitoring (BSM) OFF indicator light turns on and operation of the system is stopped. If the Blind Spot Monitoring (BSM) OFF indicator light remains illuminated, have the vehicle inspected at an Authorised Mazda Dealer as soon as possible. Some problem with the system including the Blind Spot Monitoring (BSM) warning lights has occurred. A large deviation in the installation position of a radar sensor (rear) on the vehicle has occurred. There is a large accumulation of snow or ice on the rear bumper near a radar sensor (rear). Driving on snow-covered roads for long periods. The temperature near the radar sensors becomes extremely hot due to driving for long periods on slopes during the summer. The battery voltage has decreased. The vehicle speed when reversing is about 10 km/h (6 mph) or faster. A vehicle is approaching directly from the rear of your vehicle. The vehicle is parked on a slant. Directly after pressing the Blind Spot Monitoring (BSM) switch and the system becomes operable. In the following cases, it may be diffi cult to view the illumination/fl ashing of the Blind Spot Monitoring (BSM) warning lights equipped on the door mirrors. Snow or ice adheres to the door mirrors. The front door glass is fogged or covered in snow, frost or dirt. 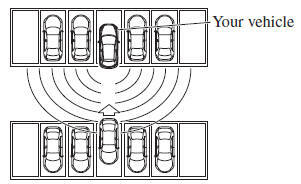 Turn off the Rear Cross Traffi c Alert (RCTA) system while pulling a trailer or while an accessory such as a bicycle carrier is installed to the rear of the vehicle. Otherwise, the radio waves emitted by the radar will be blocked causing the system to not operate normally.